Global Challenge 1: Failing to evolve a single global government with legislative, judicial, and enforceable executive powers. 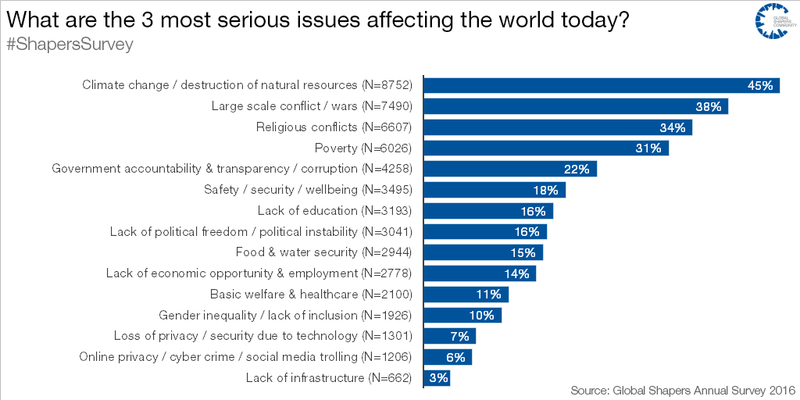 If you think about it carefully, you will discover that this first global challenge and critical evolutionary failure of having no unified or truly effective global government IS the single biggest reason and core structural cause for most of our other key global challenges (listed below) not yet been resolved. The evolutionary absence of a true global government of itself alone acts to facilitate, escalate, and enable all of the other great global challenges that we currently face. We are near 8 billion people racing to 9.4 billion by or before 2050. We are way over sustainable population levels and future and current generations will suffer dearly because we failed to manage ourselves in this area. Global Challenge 3: Our Out of Control Global Warming fueled by overpopulation global warming is caused by the carbon and methane greenhouse gas pollution of our atmosphere. Global Challenge 4: Resource Depletion fueled by overpopulation and escalating global warming. We already have increasing food shortages (1 billion people are hungry.) Ocean fish stocks are also suffering from catastrophic losses. We will be soon facing energy shortages caused by the early attainment of peak oil. Depleting our many different kinds of Earth quantity-limited, nonrenewable, and even renewable resources to unsustainable levels also increases global poverty by making those essential resources more expensive. Many resources will run out at the same time! Global Challenge 5: Global Economic Instability. All of the above challenges act in concert to increase global poverty, economic instability, economic inequality (conflicts between rich and poor) and rising national deficits. National deficits are rising in many countries in highly unsustainable ways. These deficits are happening due to the escalating costs of all of these growing global challenges. Even worse, these ballooning national deficits are moving us closer toward an eventual bursting global financial bubble. Imagine a global financial depression or crisis occurring as we also try to solve all of these other global challenges. In the next global financial crisis or global depression, there will be even fewer resources to solve the other global challenges. Global Challenge 6: Political Instability in Countries with Low Management Capabilities or Low Resource Resilience or High Deficits. All of the above global five challenges plus increased political instability act in concert to further increase the likelihood of more wars, terrorism and political injustice and low resilience nations collapsing This plus the other global challenges will create sudden and massive migrations of millions then billions of people that even the richest nations will not be able to absorb. Global Challenge 7: Global Pandemic. Excluding the challenge of having no real global government (which is an evolutionary, structural and developmental issue) and immediate global thermonuclear war, irreversible global warming is the single most dangerous challenge because it is a keystone threat and risk multiplier and the "center of the arch" for almost all of the other major global challenges listed above. a.) It is an immediate security threat already unfolding. It is causing huge global problems right now and, it is rapidly growing toward crossing more known and unknown climate tipping points, which have made global warming currently irreversible. It will end most of the human species if we do not act soon. b.) it is the largest single threat and risk multiplier and amplifier of the already huge problems caused by most of the other listed global challenges above! c.) It is also the most immediate and probable meta-trigger for the growing possibility of a chain reaction of whipsawing simultaneous ecological, economic, social and political catastrophes and converging system collapses involving directly or indirectly most of the other great challenges listed above. d.) Even though things currently may be going well in your local or national area, because of the escalating and multiple consequences of irreversible global warming, it can be said that overall we are now going through a natural evolutionary regression period involving the worsening of most of our greatest global challenges towards an eventual catastrophic convergence that will eventually destabilize our current local, regional and national areas. "Do you too believe that our current escalating global warming could trigger, multiply and whipsaw most all of the above other global challenges listed into a great catastrophic convergence and meltdown ending humanity and civilization as we know it?" Click here to see the Job One for Humanity Climate Plan to survive escalating global warming and get the most critical global challenge under control. If you do believe this to be a real possibility, then take some time now to review an honest, positive, and effective new plan that our organization is forwarding to help mitigate and prepare for irreversible global warming. If you are under 30, there is, unfortunately, one more global challenge that you face more so than those who are older. Click here to see that additional global challenge. Share This Blog Post: If you would like to share this blog post, go to the original shorter version of this post and look to the lower right for the large green Share button. Ask them to sign up too for the Global Warming Blog.